All modern isn't Mid Century. It's just that most new construction is numbingly bland. Ironic. Most landmarks along Route 66 are vintage. One notable exception is Pop's Soda Shop. 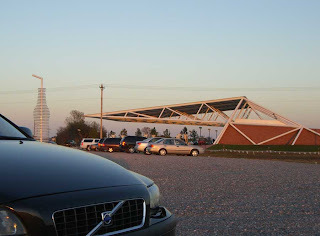 Since opening in 2007 the futuristic cantilever roof in Arcadia, Oklahoma has become an instant landmark for travelers on Route 66. But instead of a predictable Faux Fifties theme, this landmark carved a distinctively modern silhouette in the Oklahoma sky the evening we visited. Pop's is primarily a gas station and burger joint conceived by natural gas magnate, Aubrey McClendon. The gimmick is pop. Lots of pop (or soda to you out-of-towners), all housed in that futuristic landmark with a 66-foot tall Coke bottle out front. It all combines to make this gas station a destination for locals and Route 66 tourists alike. The building is the product of OKC firm Elliott + Associates, a prolific source of modernist residential and commercial structures. The restaurant building is native red rock stone and glass, open and bright. 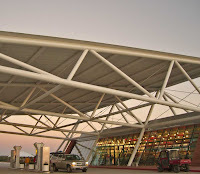 Hovering above is a steel canopy that stretches 100 feet to cover the building and forecourt. Even the gas pumps are futuristic dispensers from Gilbarco. The result? Thoroughly Oklahoma modern. It makes Pop's a unique spot to just hang out on the Mother Road. Or have lunch, gas up, or maybe even grab a pop! Off-the-shelf concrete benches spoil an otherwise contemporary landscape. We went here on our mini 66 tour in October before the Trust conference and found it to be one of the highlights of our trip - new or old. Got great soda, breakfast, and photos. I've told many more about it who plan to make the stop! POPs is on my to do list. I love this blog! Thanks for your post on mine. 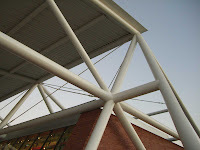 I like the Tulsa library interior a lot. The open feel, the fountain, all the tile work is nice. The plaza out front doesn't work for me. Too hot or too cold, nothing going on. I'm happy to report the lame concrete benches are nowhere to be seen! On a recent trip to Arcadia we were delighted to spy very cool white metal benches adorning the sidewalks. They were sort of a "folded paper" style that really looked great with the rest of the building.